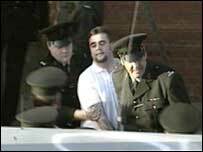 Convicted loyalist murderer Stephen Irwin is expected to remain behind bars for many years after he abandoned an appeal in the High Court. He is to serve out the eight life sentences he received for the 1993 Greysteel atrocity. Irwin, 32, had been released under the terms of the Good Friday Agreement. However, his licence was suspended after he slashed a football supporter with a knife during trouble at last year's Irish Cup Final. Irwin, with an address on Belfast's Woodvale Road, was jailed for four years for the attack. Eight people were shot dead when the Ulster Freedom Fighters opened fire inside the Rising Sun bar in the County Londonderry village of Greysteel at Halloween 1993. One of the gunmen shouted "trick or treat" before opening fire on customers. Irwin and three other UFF men were convicted and given eight life sentences for the murders. On Friday, the Court of Appeal was told that Irwin's solicitor had written a letter seeking leave to withdraw his appeal and it was formally dismissed by Lord Chief Justice Sir Brian Kerr. The secretary of state will now liaise with Sir Brian before setting a tariff - the minimum term of imprisonment in respect of the Greysteel murders. When the tariff expires, Irwin will not be automatically released. His case will then be reviewed by the Life Sentence Commissioners who can keep him locked up if they feel it would be unsafe to release him. The SDLPs' John Dallat welcomed the appeal withdrawal. "This killer has demonstrated by his violence at Windsor Park, when he slashed another spectator with a (craft) knife, that he is in no way reformed and must not earn any remission under the terms of the Good Friday Agreement," he said.